GrinGod [dot] Com » Is Fold Returning? A while ago I posted about Fold.com, a Web 2.0 homepage, had closed down and that the domain and source code for Fold was being sold off for the meagre sum of £750,000 (1,100,000 Euros). 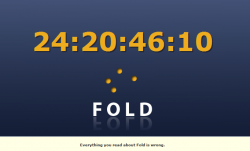 I have just been back to Fold.com to see if the site had been sold, and it seems that Fold is back on. Was the reason for shutting down Fold really due to the fact that Axel Wolf didn’t have the resources to support it further? Has Alex Wolf worked out a business model which will allow him to make money from Fold? Was the price he gave for the Fold source a sincere offer? Has someone actually paid the asking price? Is this new count-down yet another stunt to get publicity for Alex Wolf? I don’t know the answer to any of these but you can bet that I’ll be watching closely on Sun, Aug 6 2006 at 8:35am when the timer is due to expire…. viral advertising at its best! And so the saga continues. 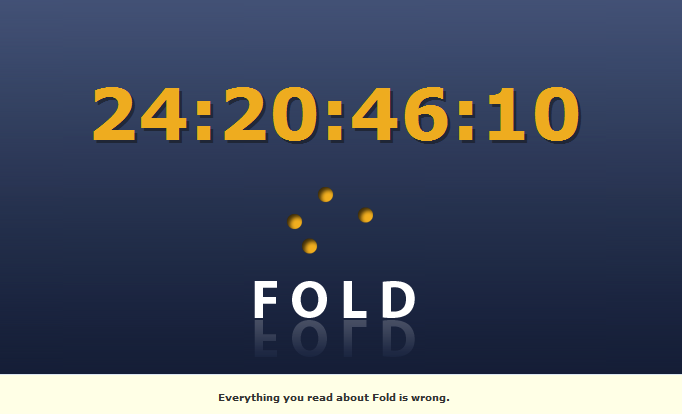 The countdown timer that was on Fold.com is no longer on Fold.com. I think someone is messing around and looking for attention. Yeah I know, I was talking about that with Phrixus only last night. I can assume that Alex Wolf was using Fold to promote his company and does intend to go any further with it.